The Japanese Chin is an elegant little Spaniel-type dog that makes a wonderful companion. Once referred to as the Japanese Spaniel, it's believed the Chin does not originate from Japan, but rather China or perhaps even Korea. The breed's image appears in many ancient art works and even on pottery dating back over a thousand years. The breed received the official name change from Spaniel to Chin when accepted to the American Kennel club in 1977. Primarily bred for companionship, the Japanese Chin is compact, quiet, and thoughtful. Chins range in height from eight to eleven inches at the shoulders. These dogs should be approximately as long as they are tall. The tail is heavily furnished with hair and is carried gaily over the back. The Chin's face is somewhat reminiscent of a Persian cat. The head is broad and rounded with a mildly prominent forehead and drop ears. The muzzle is broad and quite short, with a definite stop. The nose is slightly upturned, giving the Chin an aristocratic expression. The top rim of the nose should align with the bottom rim of the dog's eyes. The eyes are one of the Chin's most distinctive features, being fairly round and full. The cheeks are well padded, and the overall expression of the breed is one of curious intelligence and definite warmth. 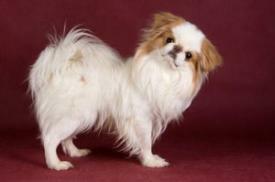 The Japanese Chin has a gorgeous coat that feels luxurious to the touch. It forms a thick ruff around the neck and chest, with longer furnishings on the ears, feet, tail and britches. It is full enough to stand out a bit from the body, although it's naturally closer cropped on the head and face. Black and white: This is the most common coloring found in the breed. Black, tan, and white: Similar to the black and white Chin, this variation has tan markings above the eyes. Lemon and white: Lemon is best compared to varying shades of gold. Red and white: Red can be anywhere from a rich orange to deep russet. Sable and white: Sable is gold mixed with black. Chins do require a bit of grooming to keep the coat in shape, but a good brushing twice a week should work nicely. Take special care to layer through the heavier fur on the neck, tail and britches since this is where a majority of the tangles will develop. It may be necessary to use a comb on the finer furnishings around the ears and feet. Bathe the Chin once a month and use a dry shampoo on the undercarriage in between baths to keep the dog fresh. Wipe the area around the eye daily with a soft cloth and warm water to remove any matter. Luckily, Chins are only mild shedders. 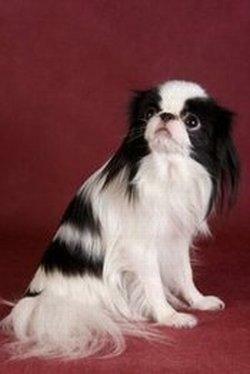 The Japanese Chin's beauty is only rivaled by it's wonderful personality. Neither a yappy dog nor a shrinking violet, the Chin is a thoughtful, loving companion capable of thinking for itself. These dogs will bark to alert their owners to the approach of people and other suspicious sounds, but they do not continue as a Terrier would. They are highly intelligent, and generally willing to please. In addition to these qualities, Chins get along well with most other pets in the home and do well with children as long as they are treated with care. These dogs treat strangers with a polite reserve. Although active, Chins are not hyper as some toy dogs can be. They do well with moderate exercise, and a simple walk will fulfill their daily needs. This makes the breed a good choice for apartment living or for homes without big yards. Although capable of learning, this breed was designed for companionship rather than performance. Housebreaking does not present any special challenge, nor does basic obedience training. However, this breed is not as well suited for activities like agility or flyball. Heat sensitivity: Due to their very short muzzles, Chins do not handle excessive heat well. It's important to keep them sheltered from the sun during hot weather. Snorting is common to this breed. Eye problems: As mentioned, the eyes of this breed are prominent and therefore subject to injury and ulcerations. This can be caused by scratching, airborne debris and loose hair. The cheek fold just beneath the eyes can also accumulate matter, and the moist environment can cause sores if not kept clean and dry. Heart murmurs: The breed is mildly prone to heart murmurs, a valve malfunction that can cause an irregular heartbeat. Bad knees: Otherwise known as luxating patellas, the ligament that holds the kneecaps in place is sometimes misaligned, and this can lead to painful slipping. Food allergies: Some specimens seem particularly intolerant of corn, so choose a dog food brand that avoids corn and corn fillers. The following organizations rescue Chins and prepare them for adoption to new families. If you're looking for a small lap dog that displays common sense with a minimum of fuss, the Japanese Chin may be the right breed for your lifestyle. Be sure to visit some breeders in person and spend time around the dogs to get a good sense of their personality. If you like what you find, begin singling out a pup or adult dog for adoption.